We all have our own ways of beating the stress that comes with living in this crazy-hectic city: meditation, wine, boxing classes, Ample Hills, wine. But sometimes the best way to decompress is with some good old-fashioned pampering. Head to one of these blissful sanctuaries for everything from nail art to body scrubs to crystal healing—then repeat as needed. This LES nail-salon-slash-café offers everything on your list of favorite things to do while winding down—we’re talking a full-fledged coffee parlor complete with wellness tonics like matcha and Beet-Chata (oh, and also wine! ), five massage rooms featuring a variety of massages ranging from the “Chill Pill” to “The Hangover Cure” and a nail bar that offers classic manis, gels and nail art. 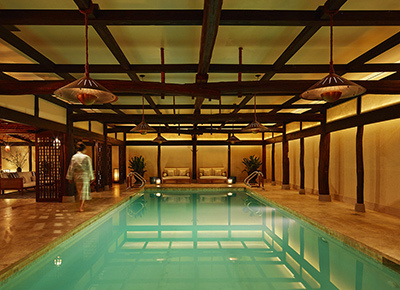 If claustrophobic city streets are getting to you, this 6,500-square-foot spa in New York’s infamously grand Plaza Hotel might be just the ticket. The spa itself offers everything from hot-stone massages to its signature black-orchid antiaging facial. Then, once you’ve been kneaded and steamed to your satisfaction, you can spend the rest of the day exploring the Plaza, home to the famed Eloise store; the gourmet Todd English Food Hall which boasts over 20 vendors; and the Palm Court, which offers high tea at noon, of course, and more. How does a relaxing nap atop a crystal therapy bed sound? That’s just one of the new-agey treatments you'll find at this alternative-medicine studio smack dab in the center of Nomad. You’ll also find a mediation pod and a pressurized chamber that delivers what’s called Hyperbaric Oxygen therapy—purported to boost the body’s ability to repair and regenerate. Then there’s the Himalayan Salt Room, which aims to soothe everything from respiratory to skin ailments, whether you choose to step inside for a quiet relaxation session or a heart-pumping Chakra Yoga class. If you’re looking for a totally immersive spa experience, Haven Spa has near-unlimited offerings: It’s a full-service blow-dry bar, nail salon, facial studio and massage parlor rolled into one. It also specializes in super-specific treatments like Facialates, a facial-meets-massage technique that activates unused facial muscles; hammam, a Middle Eastern-inspired exfoliating and moisturizing full body experience and Geek Massage, an intense combination of therapeutic stretching and targeted deep-tissue work that focuses therapy on the upper body—back, shoulders, neck, chest, head and arms. After a brief closing followed by a $60 million makeover in 2009, the former Cornelia Day Resort became the Cornelia Spa, a (slightly) less extravagant incarnation at the Surrey, a boutique hotel on the Upper East Side. It offers five quaint and peaceful suites that ooze the sophistication and relative calm of the posh neighborhood in which it belongs. Be sure to ask for the detoxifying “Purist” treatment, which begins with a French sea salt and honey exfoliation and ends with a marine salt soak. Stress = gone. If you’re looking to relax without being rubbed down, head to this immersive, all-natural apothecary, which features an inside-out approach to wellness. You can book your share of treatments, which range from the Bio-Energy Lift Facial to their Blue Eucalyptus Energizing Massage. Or you can just kick back and relax in their Sensory & Meditation Lounge or Vitality Bar, which offers Kombucha on tap, locally sourced cold-pressed juices and a selection of premium herbs and essential oils.